I would like to get some feedback (e.g. subjective impression, beta aka angle of the apparent wind, wind speed, board speed, type of board, fin & sail, and any other relevant data) from anyone who has attached a telltale to the nose of their board and has sailed with the apparent wind 90 degrees to the true wind. I did a study on this several years ago using formula gear. I made a yarn tell tale by attaching a 18 inch long stick to the luff of a sail to have it stick out forward. I used one of those old removable cams to attach it. The telltale points exactly as the apparent wind at any given time. Abeam. The faster you go the more the telltale comes in to a small angle relative to the sail. No surprise there. Apparent wind goes from 90 degrees at zero board speed, to some smaller angle with increasing board speed. Upwind. The telltale has a small angle relative to the sail. The apparent wind is knifing into the sail at a small angle. Downwind. The telltale has a large angle, sometimes almost straight out at 90 degrees. The apparent wind hits the sail from the side. The faster you go the smaller the angle. This, folks, is why we use adjustable outhaul for upwind/downwind racing. The idea is to match the leading edge angle with the apparent wind angle for minimized drag on the sail. For upwind we flatten the sail to match the small angle of apparent wind. For downwind, we bag the sail so that the leading edge has a deep angle to match the large angle of apparent wind. Believe it or not, the use of adjustable outhaul to tune the draft depth for power is only a secondary benefit. Primary is the leading edge angle at different points of sail. That thread will refresh the memory of those of us who eventually did get it but didn't retain it. I've just done the refresh and have hopefully re-got it, Beta is the angle between the apparent wind and the course direction. So you have to allow for leeway. Beta is such a useful thing for serious sailors to measure because it is a measure of the lift to drag angles of the aerodynamics and hydrodynamics combined. If you can keep the efficiency of your craft constant, (by appropriate adjustment of sail size, fin size trim and ballast) the angle Beta will be constant at all points of sail. Speed will be maximum when the true wind and apparent wind are at 90 degrees. The last point is a bit hypothetical because accurately knowing the direction of the true wind at a particular instant in time while on board the craft is not possible. The direction of the apparent wind and the course can be determined from on board the craft though. When windsurfing in eutrophic water the true wind direction can be estimated from parallel lines of foam or windrows. It is not difficult to judge from the telltale when the true wind and apparent wind are orthogonal. Blowing snow is used when winter sailing and blowing dust is used when landsailing to estimate the true wind direction. While easy to talk about, you don't really appreciate it until you see it for yourself when standing on a board at speed. Lake George SA, fits the bill of eutrophic water. We can usually see the foam lines quite well. I have to add though, that I dont take much notice of them on a speed run. I find the rght angle by 'feel' of the board and the pressure in the rig, plus the speed 'talk' in my ears. At speed it is very hard to look at things like telltales, and it would probably just confirm what I 'feel' anyhow. But I certainly agree that it is a very interesting thing to study.I am sure there are things that can help us to be learned. The whole experiment should not take more that 5 minutes of your time including the 3 minutes necessary to find your knife to cut the string - given that you are going sailing anyway. I can't speak for anyone else but I would be interested in the result. I'm sure you're not the only one. But what would you be expecting to find in this comparison between pointers and delta weedies? I get the impression that weedies run at a greater angle of attack. Just an impression because I haven't been able to get a firm number for a typical angle of attack any fin might have in the various points of sailing. And the lift to drag curves you can find on the web are a little hard to interpret if you don't know an angle of attack. You're hoping to get a useful Beta comparison however by making the reasonable assumption that the leeway angle is minimal. Then you'd be comparing the efficiency of a delta with a pointer, all other things being equal. Trouble is you won't find too many pointers at Lake George. An interesting thing to investigate with the piece of string Sailquick is about to attach to the front of his board is the efficiency, as measured by Beta, of the same delta fin, same everything, except for the depth of the water. Are there any parts of Lake George where you can find even a small section of smooth deep water? We'd then be looking at the ground effect influence on efficiency. The advantage of using Beta for this is that you don't have to wait for the same super gust of the day on the deeper water as you'd have to do if you were to make the comparisons based on top speed alone. I get the impression that weedies run at a greater angle of attack. Just an impression because I haven't been able to get a firm number for a typical angle of attack any fin might have in the various points of sailing. The slope of the lift curve is a function of the aspect ratio. Low aspect ratio fins must run at higher angles of attack to get the same lift so your impression is correct. They also have higher induced drag. If you want to know more read the Abbott & Doenhoff reference in my paper in Catalyst #52. If you still want more, read all the other references as often as necessary until you understand them. Then you will know more than I do - because I have forgotten a lot. As interesting as this sounds, I think it would be very challenging, since the difference in angles is probably less than 10 degrees, and the twine will flutter around quite a bit. Wind speed, direction, board speed, and board angle would also have to be pretty much identical, since your indicator shows the angle of the apparent wind relative to the board. Changing angles on a broad reach changes the apparent wind direction a lot - for example, going from 130 to 140 degrees changes the apparent wind angle by a full 10 degrees (45 to 55, 20 knot wind speed, 28 knot board speed). You basically have just one measurement, but five variables. Fin theory is all very well, but none of the models take into account the effects of the weed. It appears to me that the weed improves efficiency by acting as if you are in very shallow water. The water here also has very high salinity. The measuring station appears to be broken now, bit we has x3 times ocean salinity in a previous year. It is lower now, but still a lot higher than ocean. I will try sticking a string to the nose, but I forsee a nuber of possible outcomes. -Fear and tunnel vision at top speed blind me to observation. But it sounds simple so I will try to do it. You basically have just one measurement, but five variables. Which is the whole point of using Beta. It reduces those five or so variables to one parameter. It allows competitors to identify the combinations of variables where Beta is not so good and see if anything can be done about it. It probably will be difficult in practice for Sailquick to make much of the tell tale fluttering away. But it'll be interesting to hear his report. There are direction indicators with electrical outputs that can be filtered, logged and plotted. I wouldn't be surprised if the likes of AC yachts have a direct readout of Beta on the console that the tacticians sail trimmers, navigators etc. huddle around to see where they are going wrong. If Beta turns out to be consistently higher or lower in salty or weedy water but you have kept the flatness constant then you will have shown that they are important variables. Ian K said.. I wouldn't be surprised if the likes of AC yachts have a direct readout of Beta on the console that the tacticians sail trimmers, navigators etc. huddle around to see where they are going wrong. Perhaps if they had spend more time on the water practising with a string they may have won? The most experienced hyperwind racers are iceboat racers. They depend on telltales. If you want to win an AC cup put an iceboater in command and increase your budget for string. You want that telltale string to be out in clean airflow. Fastening it to the top of the nose of the board is not clean air. Neither is fastening it directly to the leading edge of the sail. You have to affix a stick to the sail that protrudes forward of the leading edge, say 18 inches. Then fasten the telltale to the end of the stick, but keep the telltale short enough that it does not touch the leading edge of the sail. That will be in clean airflow. Also, protruding a stick 18 inches above the top of the mast is also clean airflow, but is much harder to see. The flow that produces lift and drag on a sail is the flow within the boundary layer. The purpose of attaching telltales directly to a sail is to see if the boundary layer has entered a region of adverse pressure gradient and separated from the sail. If so, that region of the sail is no longer contributing to the lift. 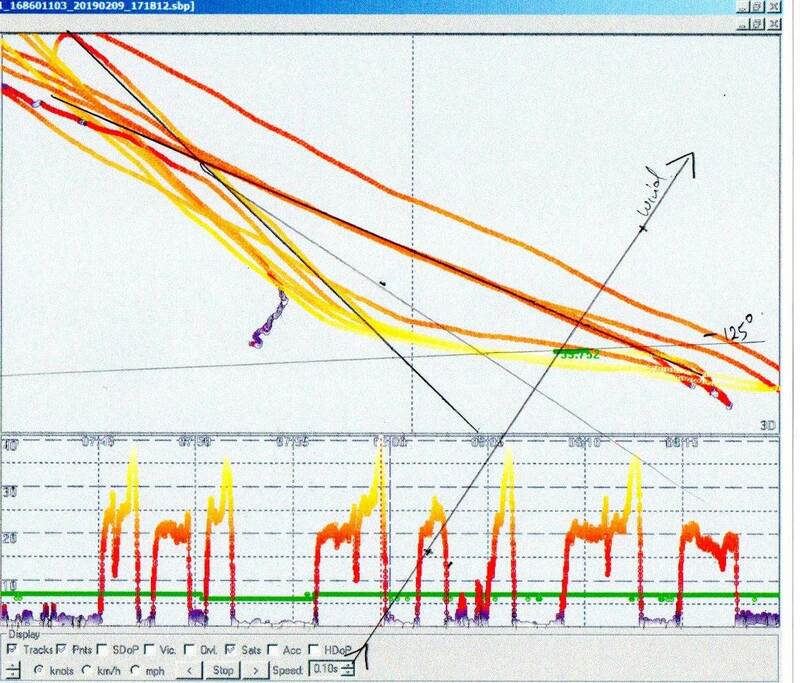 The clean airflow that you are measuring is the potential flow around the sail and sailor. Yes, you are right. A telltale on the sail itself tells you about airflow within the boundary layer. For a windsurfing sail you want it to always be facing the clew. Reverse airflow on a windsurfing sail is a waste. I am talking about using a telltale to observe the direction of apparent wind as you sail upwind and downwind. So if you have actually done the simple experiment that I suggested, what is the minimum value of Beta that you measured while going flat out on a broad reach? BTW, because the wind is not coming directly over the nose, attaching a telltale to the nose or at some distance behind the nose has not been a problem with respect to turbulence generated in the lee of an upturned nose. At least not in my experience. I have attached telltales all over my gear. The only telltale that I was interested in was the apparent wind one in front of the sail. To answer your question, when I managed to get a really fast speed 60 degrees off the wind on a formula board, the telltale stood out to the side, about 20 degrees in from straight out 90. This is why you release the adjustable outhaul for the downwind: to get the leading edge to curve in to that 70 degrees and reduce leading edge drag. What size fin (span & MAC), what size sail (area & camber) and approx. wind speed? Standard formula gear. Formula board, 70 cm fin, 11.0 m sail, wind 15 kts, sailor weight 200 lb, upwind/downwind formula course. I forgot to ask, what was your really fast speed 60 degrees off a 15 knot wind? What kind of gps did you use? Downwind boat speed was about 25 kts, and I was pretty much terrified. Guys and gals that race a lot are used to this. At that time I was using a Garmin Legend H in a bag on my arm. That Garmin also uses doppler for speed. I'm having trouble understanding your posts. When you say, 'Downwind boat speed was about 25 knots', do you mean the downwind component of the boat speed going 60 degrees off the wind (Vmg to leeward)? Or, the speed of the boat going 60 degrees off the wind? What 'boat' are you talking about? I thought you said you were on Standard Formula gear? The term "boat speed" is pretty standard stuff for talking about a racing windsurfing board. At least up here in the USA it is. I was talking about the actual gps speed of the board going downwind 60 degrees down from abeam. I am not good enough to go deeper than that, but 60 degrees is already pretty steep. On my L10 formula board I can do that by staying in the outside straps--not using the chicken straps. Much faster that way. Formula racers everywhere are familiar with this stuff. I have not had an oppurtunity to do any telltale experiments, but it struck me that some of my sessions show a very regular pattern where I can get a very good approximation of the wind direction, and therefore the angle of my runs. I looked at a recent two last night. I printed them off and drew lines on them using a Protractor to try to estimate the wind direction. In both examples, where I got top speeds just over 40 knots, the angle worked out to 125 degrees off the wind. Now that surprised me. I thought it would be more like 130 deg.. But I can think of a few areas where my wind direction calculations could have been misled, and also the wind strength was only high 20's to barely 30kts both times. I have definitly found in the past that stronger winds lead to broader angles as well as faster speeds. And I may have not been pointing as high on both tacks for other reasons. This could easily account for at least some of the expected difference. If these estimates are somewhere close, and the gusts on those runs were, lets say 30 knots for simplicity, someone with mathematical abilities should be able to work out the Beta in this example. Barney, I assume you are looking for evidence that fin size and efficiency effects Beta as well. A natural area to explore for sure. But I think that will be much more difficult to quantify than it may appear at first glance, at least in speed sailing. We almost always use the fin size and type that we know from experience works best in the given conditions. If there is clear water (no weed, or very little) we use a higher aspect and more upright fin. This is the classically more effecient way to go. If there is some weed we may be forced to use a 30-40 degree raked fin, and these are usually a little bit lower aspect and have slightly more area. If it is thick weed, we will be forced to use a much lower and much more raked fin. Now these Low AR, very raked fins are obviously less efficient, but it seems that we dont suffer quite as much as one would assume. The most obvious reason is that in these conditions the water is almost 'glassy' smooth. But there is also a strong suspicion that the weed makes a type of 'endplate effect', and possibly a 'Ground effect' which mitigates the loss of efficiency at least somewhat. So in many, or most of the conditions we sail, we simply can't do a reasonable comparison of different types of fins, as we will be limited in what we can successfully use. In weed we must use weed fins, and in clear water we don't want to use them as they are dangerous (spin out in chop) and slow (more drag). Have you been able to confirm your downwind angles using the method I used above, or something like it? 60 degrees from abeam is, of course, 150 degrees off true wind direction. That would seem quite feasible to me, but it would be nice to have some data to confirm that. If you have a reasonably steady wind direction for the whole race, your upwind and downwind angles should be much more reliable and symmetrical than mine. For those apparent wind tests I was doing, I sailed on a narrow mountain lake where I knew the exact wind direction. It was 265 degrees all up and down the length of the lake. Ideal spot to practice formula. 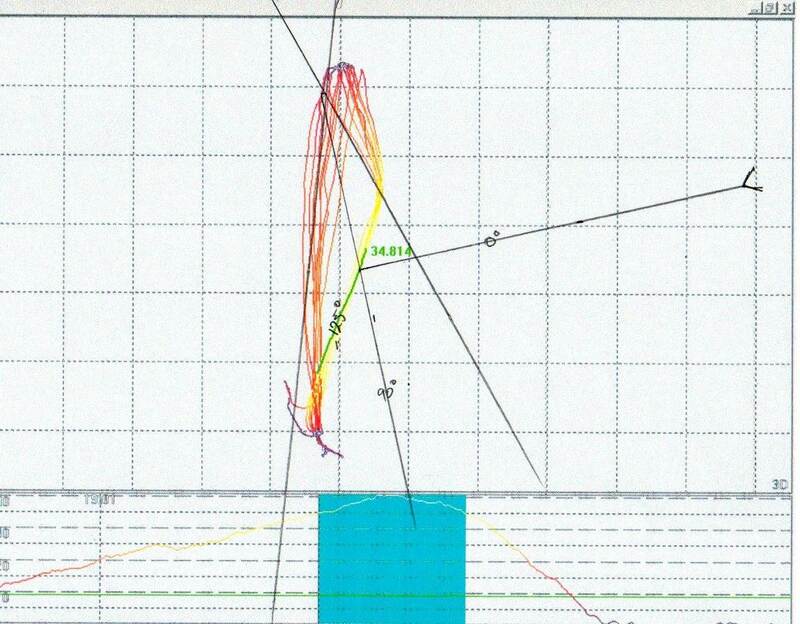 When I plotted my downwind tracks, it was easy to conclude the 60 degrees (off abeam) or 150 degrees (off true). When I was going thus downwind at 25 kts (really scary), my apparent wind telltale was sticking out to the side, nearly 90 degrees from the sail axis. Formula windsurfers were designed for max Vmg upwind and downwind for racing at the two slowest points of sailing (i.e. upwind and downwind). They carry huge sails and are not speed machines. My custom speed board can go faster than 25 knots at 70 degrees off a 15 knot wind using a 5.1 m^2 sail. I tried to attach a pdf of some data but it didn't work. The little experiment that I suggested is not for me, I've already done it on ice, snow, land and water - it is for you. I know what the results are but it can be enlightening to experience it yourself. But you are right, it is more difficult to do quantitatively on the water than the ice and it gets more difficult the faster you go. So do it in a light offshore 20 knot wind where there is smooth water with plenty of depth. What You KNOW the results! That is not the impression you gave in the early posts. I would also be interested in a descrption of the design of your speed boards, sails and fins that you say you have done these experiments with, and the conditions you did them in. You can attach image files so just convert your PDF to an JPEG.